Many of you have worked with the GelliArts gel printing plate, and dozens of technique demonstrations are available on the GelliArts blog and elsewhere. I don't have anything new to show you in terms of techniques. However, I do want to show you how Golden Open Acrylics work so well with the gel plate. They remain wet and workable for WAY longer than other acrylics, so they are ideal for gel printing, giving you time to think about and develop each print pull. 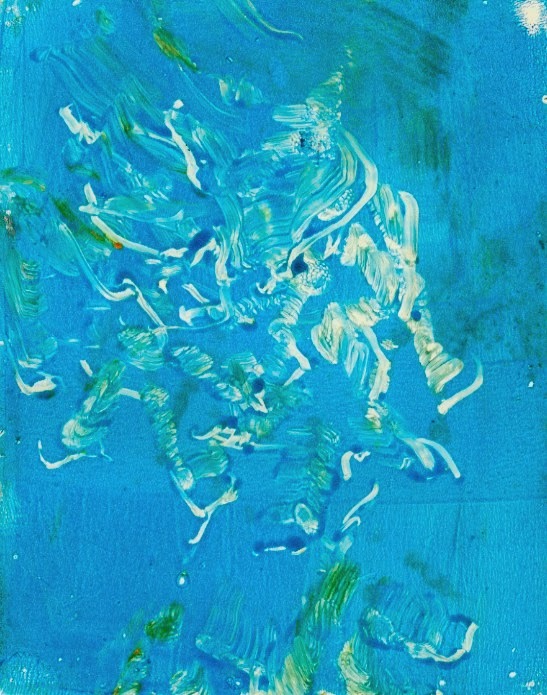 You can mix the Open acrylics with regular acrylics or acrylic mediums, and that will speed up the drying time; for example, mix Open Manganese Blue Hue with Fluid or Heavy Body Manganese Blue Hue, and you will get a paint that dries faster than Open, but slower than regular, and at full pigment strength. Or mix Open paint with regular matte medium or gel, and the result will dry faster than Open, and be somewhat extended (diluted). This is the preliminary print, 10"x10". This is the piece more developed, not sure if it is finished yet. This is a 12"x12" preliminary print. ... and the same piece with collage and paint, still in process. The next three images are preliminary prints with no collage or paint added. I will be giving away a 6"x6" GelliArts gel plate, along with a few sample Golden Open Acrylics, to a random person who comments on this post. You must be in the United States to be eligible for the drawing (ALL of the United States). I will do the GIVEAWAY on Monday, January 13, so check back to see if you won! PS: if you choose to post any of these images elsewhere, please label them as works in progress. Thanks. I love how you use so many colors and it still looks like one cohesive piece. 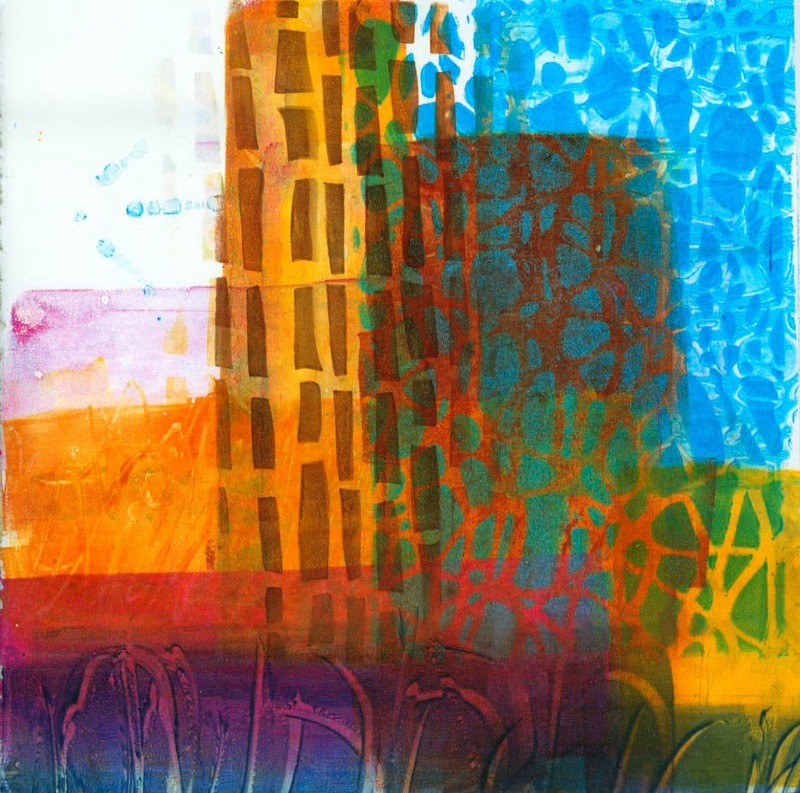 I've played with some monoprinting before and would love to try my hand with the gelli plate. Thanks! I I love your work. Even your collateral pages are great - although those are usually my best pages too. I learn so much from watching how you select your colors. I always love watching your videos - the chicken walking on your art was fun! Thanks for the chance to win! 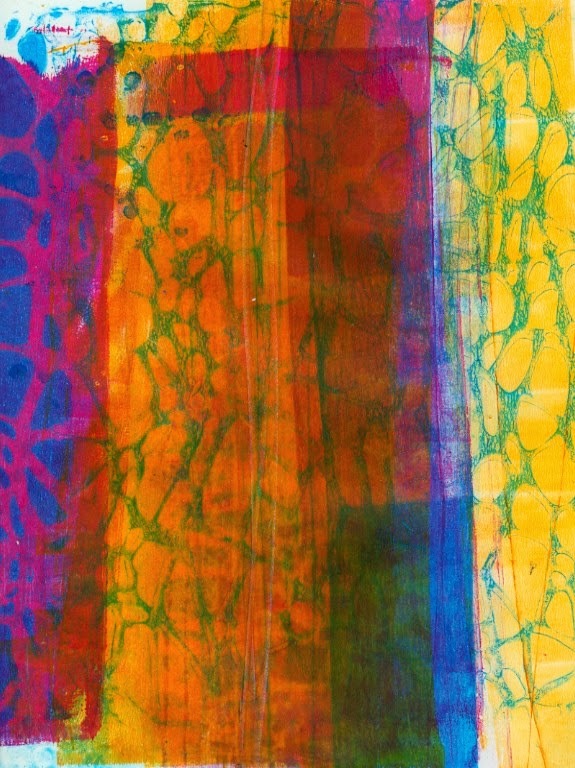 OMg Jane, the Gelli prints are fabulous and make me want to sit down right now and try them. Love love love the colors and designs,. I've had my plate for at least two years and haven't used it yet. Maybe I can fit that in this weekend with your inspiration. First I have to check my dungeon for my acrylic paints to see what I have. Thanks for the tutorial and the beautiful results. Please don't use my name in the drawing as I already have the 10 x 10 plate. I love what you did with the Tulip Slick along with the open acrylics. I've got to get some of that! I love that you included your Amelia to the Gelli plate printing! Thank you!! Oops. Meant to mention the paper. Go to my Links page on my web site, then click on Favorite Materials. The 10"x10" and 12"x12" papers are printmaking paper, and the "junk sheets" are cheap drawing paper. Thank you. I seem to remember you having that info available but forgot where to find it. Haven't tried the Gelli plate would love too. Love the prints you've done. Even in progress are beautiful. Wow this looks fun to try! I don't have a chicken to play with but I will certainly try your layering technique. Very nice work. I have watched your video and love your process. 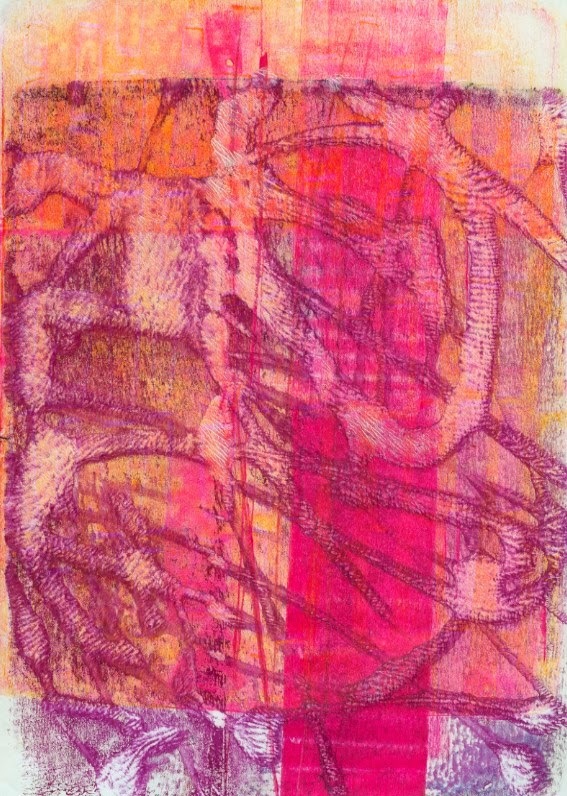 I have done mono printing in the past but I have not done Gelli prints before. Jane, I'm not familiar with Tulip Slick paints. Was that white Tulip Slick paint that caused the pattern because it was white? or does it have some property that causes it to act as a resist? LOVE these. Count me in kiddo! Thank you for sharing! Absolutely beautiful work. I laughed out loud when you put your chicken on the plate! 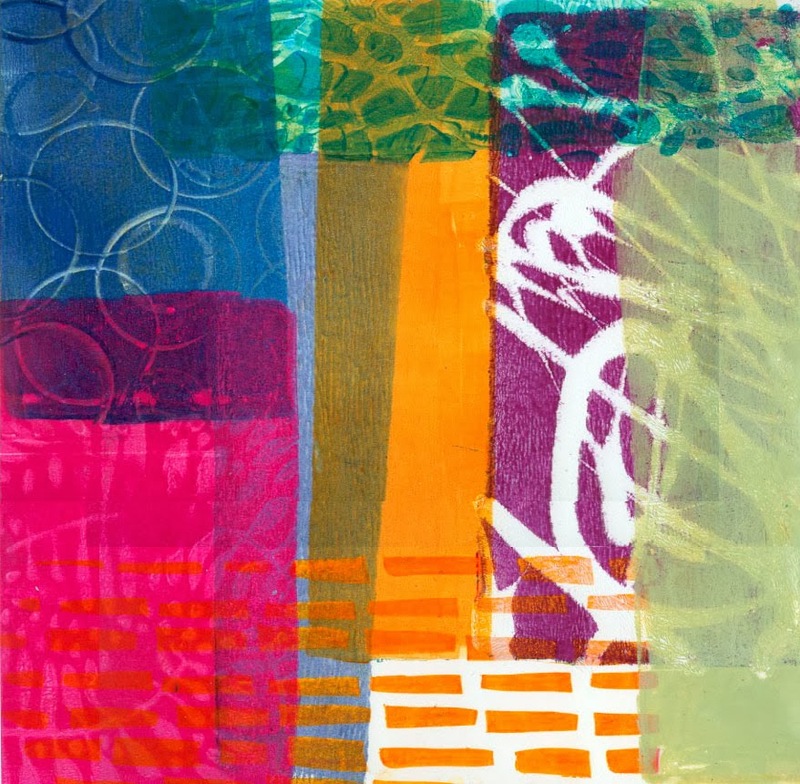 Why don't my Gelli Plate prints look as good as yours? Amelia's blue print is quite impressive! Your girls are so talented. Open acrylics are all I use on my gelli plate. They are really wonderful! Beautiful! Count me in for the drawing! I think Amelia is well on her way with original and unique mark making. I am jealous. Always a great video. Always wonderful work. Seriously, though, YES, I have some high-flow acrylics, and I use them in a fine-line applicator to make gestural lines. That's what I used in the second image above. Maybe I'll do a video demo on that, once I get a better handle on it. I did a spit take with my coffee when I saw Amelia making her "art" ... thanks for the chance to win. Love your work and the exciting tutorials. I got a chance to try a Gelli pad at a show but was unable to purchase at that time. Would love to win this one. Your art is so beautiful and your color selections splendid! I'd love to try out the 6X6 Gelliplate and the Open Acrylics. Your artwork is fabulous. You make everything look so easy. I would love to win the GE LL I plate. Love the colors you've used. Gorgeous. Inspired by the way you print several papers at the same time. How gracious of Amelia to join in the fun. Thank you for a chance to win. I love your work. You inspire me to try something new with every tutorial you post. I love your use od color and your creativity and most of all your sharing spirit. I can't wait till your on line workshop starts in march. I would love to win the gelli plate and open acrylics. thanks for the info about the paints. would love to win since i've been noodling with the idea of getting a gelli plate and giving this technique a whirl…it looks like a ton of fun, and your prints are pretty inspirational! This looks like a lot of fun, would love to give it a try. Thanks for the demo video! There is going to be a very happy winner! Love this video Jane as I love all your videos. This one in particular was fabulous because you shared the screen with one of your adorable chickens. She was for the most part very cooperative and creates lovely work in her own right. 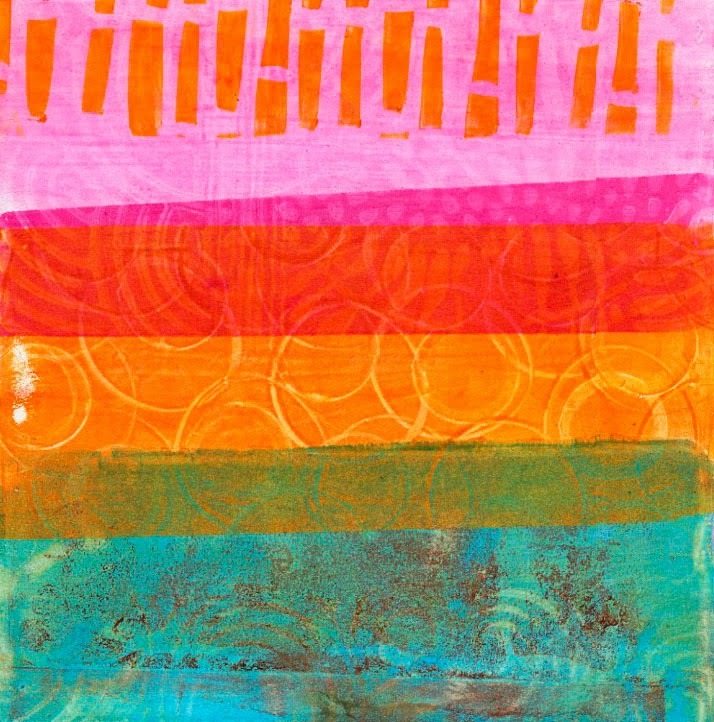 I especially love your color choices and now I want to go run off and make gelli prints! Thanks for your generosity and inspiration! WOW! I was just about to decide to put my gelli plates away; but now I'm inspired! These look terrific and inviting and definitely approachable. It's a new year after all. I'm not sure which I like better, your pages or Amelia's art. I've never known of an artist who paints with chickens, and I've never seen that technique demonstrated for a gelli plate before! I do love watching your videos. The only thing better is watching you in person. I do love watching you work in these videos. You always inspire me to try things by simplifying the process to a point that makes it "doable" for me. Thanks for sharing, Jane. It's funny how someone else's gelli prints always look better than one's own LOL. I'd love to try the open paints. There's not art store that carries them within 60 miles of me so I'm unlikely to go buy any. Thanks! Have not yet tried the Open Acrylics but they are on my short list! Thanks for sponsoring the giveaway. I'm intrigued by the Gelli Plates, as I prefer making my own backgrounds for cards and collages when possible. Yes, it would be fun to try this!! Thanks for the chance to win one!! Oh, I love the results and options with gel plate and acrylic paints! I would love to have one to play and create with. Thanks for showing this and having a giveaway!! It was fun to see how wonderfully the pieces turned out after seeing your unique was of printing-not sure the rooster would let me use on of the hens. My local art group is doing a GelliPalooza next Sunday - thank you for the wonderful inspiration. 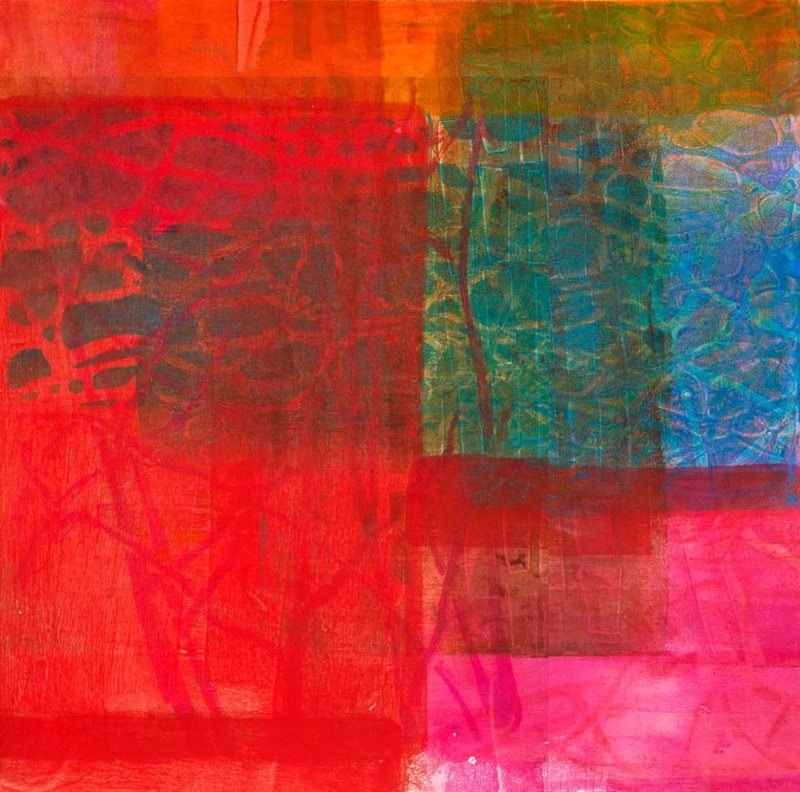 The possibilities with Gelli are just unlimited. Looks like so much fun - thanks for the chance to win! You are wonderful to share this great information. I love your "Scribble Collage with Hand-Painted Paper" video and highly recommend it to everyone. Tomorrow is my 68th birthday. I never tire of learning more about art. I have taken a gel printing class but not as many mark making techniques as yours. I found on utube how to make your own gel plate like the brand you are using by using silicone gel (used in soapmaking) and the gelatin. which holds up way better than Knox. Great results Jane. I love what happens after you develop them. I love your tutorials - they always give me way more inspiration than I know what to do with. And the addition of Amelia was absolutely delightful! Thanks for the chance to win! Thank you for sharing your amazing talent & knowledge as well as this great give away. My goodness your think outside the box... only you would have thought of chicken feet. I love it! Love the chicken prints! Well, I love all your prints, but the chicken print was priceless! I loved the Gelli video. I now feel so much more at ease with trying some Gelli prints. Thanks! I'd love to win the Gelli plate. Lovely video. As always, very inspiring! I can't wait to start working with the Gelli plates. Thanks for sharing. 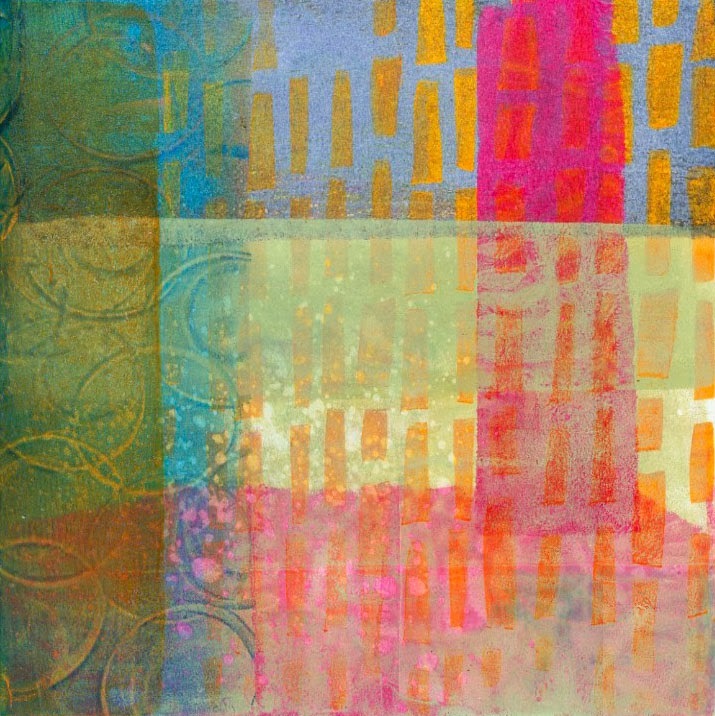 I have used a Gelli Print before at a class but this video was a 'lightbulb' moment for me - I can all of a sudden see how these techniques will bring a whole new level to my work. Thank you! Love your work and the chicken! I believe that my husband will put a negative on the idea of getting a chicken for my art work. Thank you for the lovely video. Love your work. I hadn't realized you could mix the Open acrylics with regular ones. Thanks for the tip! Having a chance to win the Gelli plate is really a tremendous gift. Sharing your artistic talent with all of us who follow you is such a treat. Haven't tried the Golden Open acrylics yet. Given your recommendation, I will. Very inspiring! I just bought a tube of Golden open acrylic and now I will give it a try. I always look forward to your informative tutorials! Thank you so much for being so generous with your teaching time. What a great video AND kudos to the chicken! I wonder if I could get my cats to cooperate? 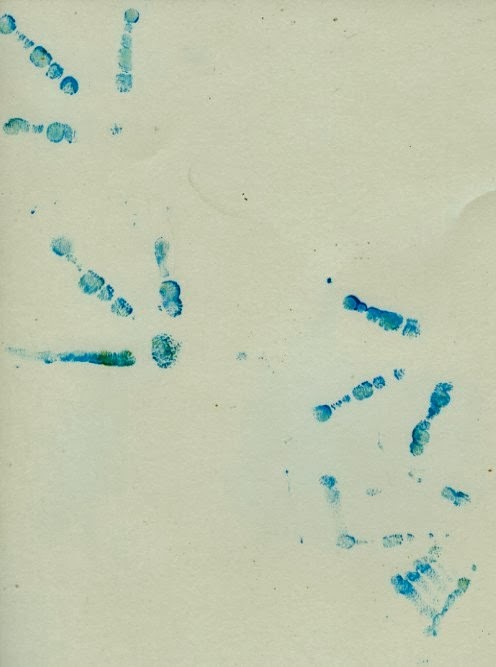 The Gelli prints are intriguing! Thank you for sharing. These are fantastic. I love the way they went together. The colors and patterns are awesome. I need to do some more work. My Parrot would eat my hand if I put him in ink and tried that. I'm attracted to the many patterns and textures you've created, as well as the bright colors in your palette. It's apparent that the quality and type of paint along with your way of approaching Geli printmaking are the ingredients to these lovely prints! Thanks for the great step-by-step instructions, for I find your work to be a wonderful inspiration for me! Once again, thank you for a great video Jane! I love that Amelia joined in the fun with you. 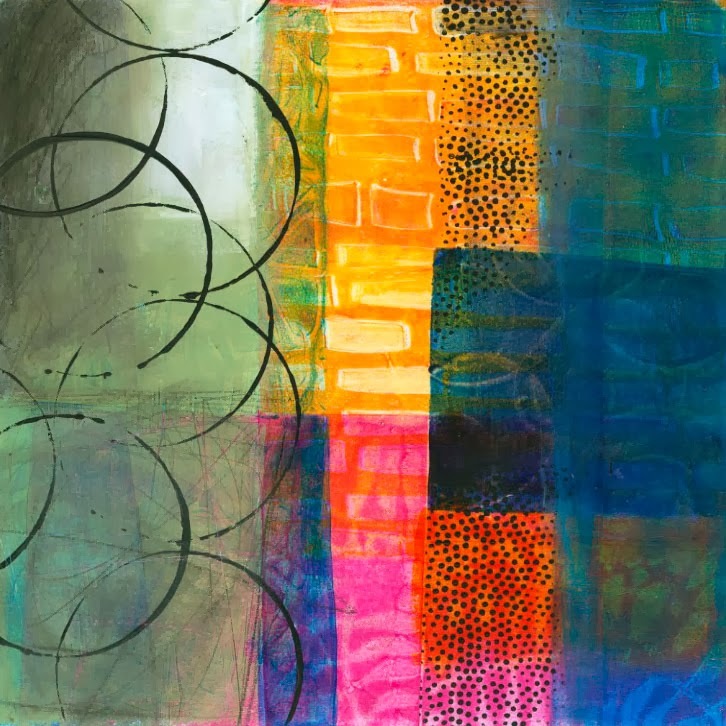 I have not invested in a gelli plate yet and would so love to win one. I really enjoy seeing the beautiful and unique artwork that you and others create with this great tool. Thanks again! Love the collaboration between you and Amelia! Thanks for offering the giveaway. Hi, Jane: I would love the chance to win a gelli-plate - looks like so much fun! Love your art. I am very intrigued by this process but have yet to try it. Thank you for the opportunity to do that and hosting this very generous giveaway!!! Thanks for sharing this demo I love your work. Is the trained art chicken included in the giveaway? I must try some of these Open Acrylics. The acrylics dry so fast on the plate, especially when you are only doing a light coat. Thanks for the give away. Will have to try open acrylics when I get a gelli plate. Thanks Jane once again for your demos and thank Amelia also for her part. I would love to try the open acrylics. I enjoy your updates, your work resonates with me. I would love to win a "real" gelli plate. I've been using homemade ones to work on and would like to see if there's a difference. Thanks for taking us on your Gelli journey -- we're holding on tight to see what the future holds! I think I need to take over the dining room! The prints look wonderful . . . a very satisfying thing to do. Such wonderful vibrant colors! I've seen the gelli plate, but never had the opportunity to try it. Looks like fun. Adore the chicken...obviously the 'must have' art tool. Want one! Would love the chance to win. WOW! LOVE your pieces. I would never have thought to use open acrylics or to combine them with heavy acrylics or matte medium. I agree with others that your preliminary pieces look almos finished! 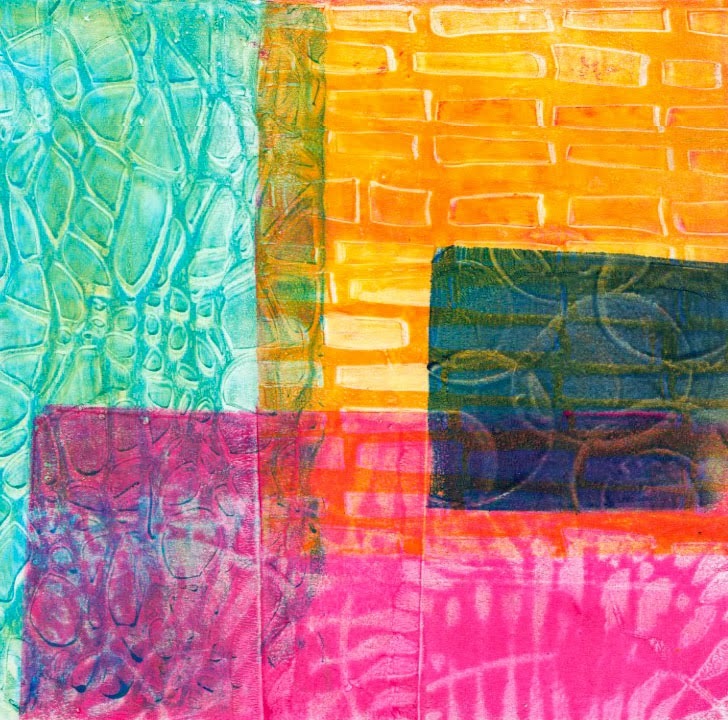 Do to use a 12x12gelli art plate or do you make your own gelatine? Thanks, Sharon. I am using the 8"x10" GelliArts plate. You make this look so easy and fun! 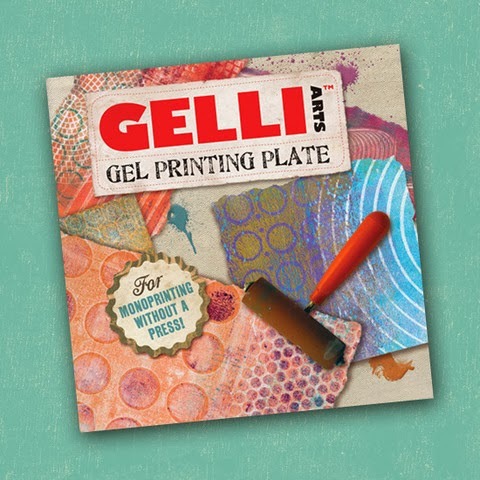 I'd love to try the Gelli Plate- thanks for the chance to win one. Your video was excellent instruction. 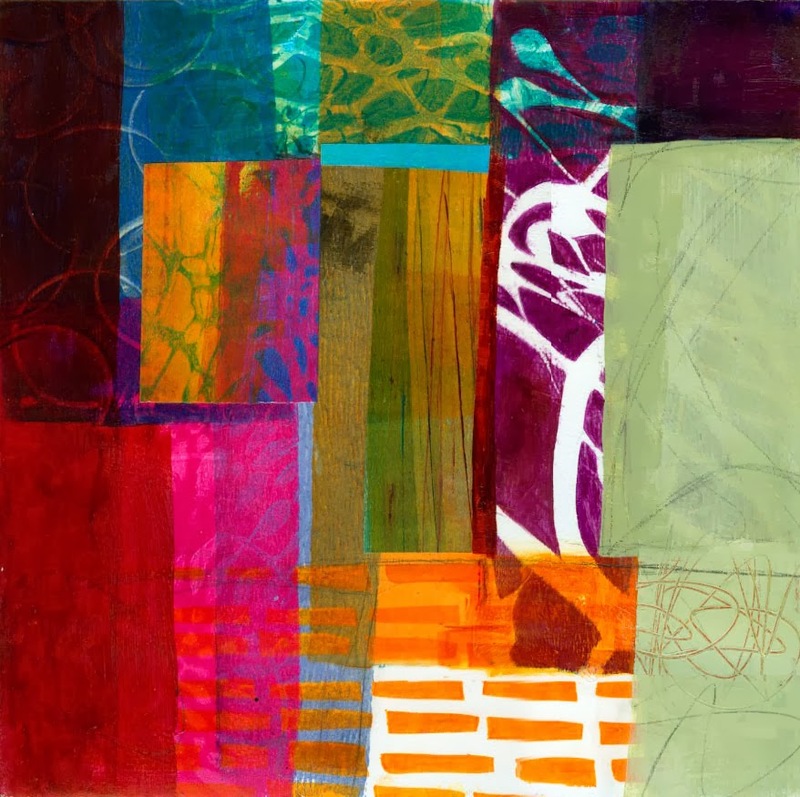 Interesting ways to make Gelli prints. I have used mine quite a bit but not tried the partial prints on different papers. I also like the combination of different kinds of paints. Lots of ideas to try. 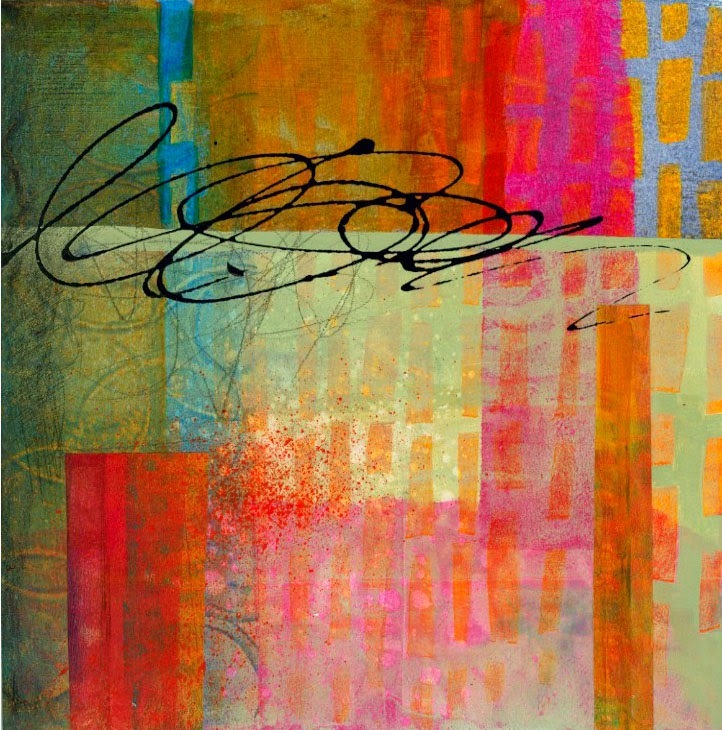 I am new to Gelli Prints and would love to try it out. Thanks foe the Chance. Good to know about the open acrylics. I've never tried them. More great ideas. I love Amelia's footprint art!! A loyal follower. I hope you don't plan to eat your art assistant! How exciting. I don't know open acrylics so that would be a special gift.Your work at all stages is beautiful Jane. Unfortunately, I do not have a chicken to collaborate with, and my cat is into interpretative dance. I'd still like to learn to use the Gelli print plate and the Golden Open acrylics and add a new dimension to my collage art. Thanks for your consideration! A gelli plate is still on my wish list...Thanks for offering this gelli plate and we can all hope for the best. I enjoyed the video...thanks! I've never worked with the gel plate, and you made it seem as so much fun. I would love to try! I love your videos. It really inspiring to watch your work process. Your work is inspiring Jane. I love what you do with the Gelli Plate! Thank you for sharing! Great info as usual. Would love to win! I hope to use your video as inspiration at a "play date" with friends this Thursday. I already find your collages inspirational. Thank you!! I've been bitten by the gel printing bug but as yet have no plate --- would love to win this one! Thanks for your informative and inspiring blog! Jane, as usual your post is informative and inspirational. I'd love to win! Thank you. Thanks Jane, Always, always, always, need more ideas with print making...also details on what paper you are using...Would love to win the open acrylics to try them out before spending (it is January after all.) Thanks again. Hi Jane - great to hear your voice again! Loved all the ideas you generated from the plate and hope to see Amelia again in the near future in another video. Thank you for the fine art inspiration! Amelia was a joy to watch and I hope she makes another appearance. :) I hope to be able to take a class from you one day. Always love your videos, love watching the choices you make as you progress with a piece. Very inspiring. Not as inspiring is the high standard Amelia has set for the rest of us. lol. Would love to win, and also to see more snippets, chicken and non-chicken. I will be doing another giveaway of a set of Open Acrylics. It's a sample set of teeny tiny tubes - 1oz I think. So keep checking the blog. I already sent a comment but I don't think it went through. :( I LOVE your work & watching the video! As usual...Fabulous! and I think Amelia is one of the best co-stars ever. Thanks for the chance to win! Love your blog! I haven't tried Goldens open acrylic paints but would love the opportunity! Thanks for your posting! Jane just finished your demo....what was the name of the tulip paint you used.....loved the thin lines you were able to get! Thanks again! Tulip Slicks. You get them at JoAnn Fabrics and places like that. Or Amazon. Not in the States - so sadly don't qualify for your prints - but love you progress and find it inspiring to move from my drawn quality to your wonderful freedon - particulalry Amelia's progress!! Cheers - Jane thanks for the power of freedom!! Wow very neat! Will have to give those Open Acrylics a try. LOL on Amelia's prints...thanks for the reminder about the open acrylics - they're next on my list to start collecting! Can't wait to start "playing" with a Gelli plate! Gelli plate printing is wonderful. Spent the weekend playing with my new plate and even posted my first efforts on Pinterest. Can't wait to try out the open acrylics and wonderful techniques. I've been wanting to try the Gel plates. I've made my own and would to compare it to this. The open acrylics are great. I've used them for foam plate printing on fabric. Have not tried the Open Acrylics yet. This sure would make a nice birthday surprise. Thanks for sharing the video, great as always! Absolutely gorgeous! The univers is telling me I need a gelli plate - thank you so much for the chance to win and the brilliant tutorial! I LOVE the colors in your prints, so vibrant and alive. Amelia....love her! A gelli plate has been on my to buy list so I am keeping my fingers crossed! Thanks for the review. Love your prints. I was thinking about buying one of these. Lets see. Thanks for the hints on the different paint mediums! It is so helpful! Really cool art your are creating!!!! I may be too late to win (and I hope I am not) but your prints are just so beautiful! I am going to explore your blog more and see what else you have been doing. Thank you for sharing! You inspire me, thanks for sharing your talent and tips. Deeply appreciated since I'm new at this. What's the source for the great brick/grid stencil you used? I think this is from Julie Fei Fan Balzer. Try her web site. Chook prints are a winner! You've ended up with some fab images there. Your prints are beautiful. Love the colors. I have never tried this but I 'm inspired to try. I am really excited about the multiple use of the single print image for doing a series, that would have elements of a repeating pattern dispersed throughout. Lots of fun for sure. Greetings from my hen Letitia. I am ready to jump in to printing multiple layers. I have done single prints using styrofoam from the grocery and am just graduating to Gelli plate printing. Very excited to watch, learn and get inspired. Thank you!